As was expected, WBA super middleweight champion Andre Ward (27-0, 14 KO’s) took the bigger, slower Edwin Rodriguez (24-1, 16 KO’s) to school tonight in pounding out a dominating 12 round unanimous decision at the Citizens Business Bank Arena, in Ontario, California, USA. The judges scored it 118-106, 117-107 and 116-108. The fight was ugly at times due to the back and forth roughhouse tactics that both fighters used. Ward turned the fight to the inside in the first two rounds with him smothering the bigger Rodriguez’s shots. But after the 2nd round, Ward began to use more separation to take advantage of his superior hand speed to dominate the action. In the 4th round, Rodriguez wrapped Ward into a headlock and pushed him to the ropes. Ward then nailed Rodriguez with a big left hand thrown while still being held in the headlock. Referee Jack Reiss then called for a break, but both fighters ignored him and continued to throw punches. At that point a left hook from Rodriguez grazed the chin of Reiss and angered him. Reiss then called a time out and took 2 points off from each fighter for failing to listen to him. In the 5th round, Rodriguez was able to hit Ward with some good shots while they were in close. Ward still dominated the round, but Rodriguez definitely got his attention with some hard shots. 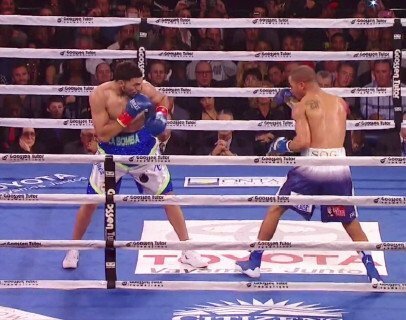 However, in the 6th round, Ward moved to the outside and began to pot shot Rodriguez with jabs, left hooks and right hands and make him look bad. From then on, it became really one-sided with Ward using his superior hand speed to get the better of the bigger Rodriguez. It was all Ward from rounds 7 through 10th, as he was able to land his shots with blinding speed to catch Rodriguez before he could get his shots off. It looked like Rodriguez wasn’t considered with trying to match Ward’s output. He wasn’t even trying to jab Ward or keep up with him punch for punch. Instead, Rodriguez appeared to be looking for one big shot to see if he could hurt Ward. In the 10th round, both fighters traded big shots in one of the most competitive rounds in the fight. Ward hit Rodriguez at one point with a big left hook that snapped his head back sending sweat flying to the crowd. Rodriguez took the shot without any problems. It could be the fact that he was so much bigger than Ward that made it so he could take his best punches without showing any signs of being hurt. Ward finally was able to hurt Rodriguez with a big left hand late in the 11th round. It was a shot that Ward landed right at the same time that Rodriguez was trying to land a big left hook of his own. Ward’s punch got there before Rodriguez’s and it snapped his head around sideways causing Rodriguez’s to roll backwards inside of his head. Surprisingly, he kept coming forward after getting hit with that shot. The 12th round was all Ward with him hitting Rodriguez with some brutal shots to the head. The two came together in a clash of head near the end of the round that opened up a cut on the side of Rodriguez’s left eye. After the judges scores were announced, Rodriguez stormed out out of the ring without giving an interview to HBO. It’s unclear if he left because he felt that he should have won or if he was disgusted with his self for his poor performance.